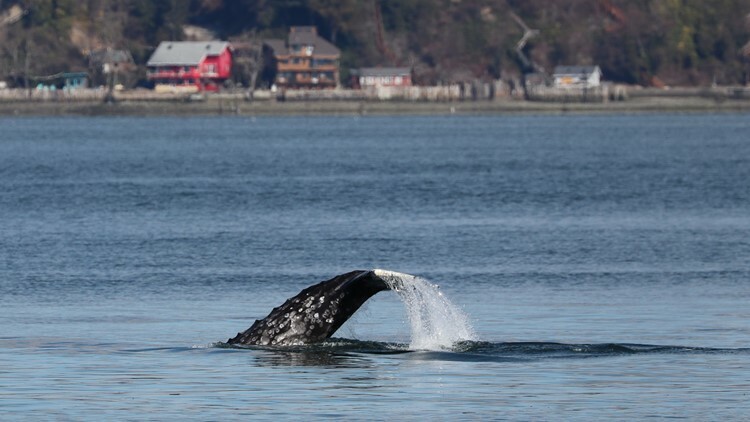 Could gray whales return to Puget Sound year-round in search of food? The same gray whales that return to the Puget Sound year after year gave researchers and whale watchers a surprise this year, breaking decades of migratory habits. Every spring Patch, Little Patch and Dubknuck have been swimming into the Puget Sound on the hunt for food. Little Patch broke decades of tradition this year when he arrived in the second week of January, months ahead of schedule. Little Patch is one of a dozen or so gray whales known as "Sounders" that return to the Pacific Northwest year after year in search of food. The Orca Network reported his sighting off Hat Island on January 11, "more than two months earlier than typical arrival times." Since the early 90s, this small collective of whales has made its return like clockwork, swimming 150 miles off course from thousands of other Arctic-bound whales to north Puget Sound. They're typically spotted around the Sound between March and May. "The discovery of that area was probably driven by desperation and not great conditions. Their annual return shows they've discovered something good," said John Calambokidis of the Cascadia Research Collective. The whole gang isn’t back together quite yet. Island Adventures Whale Watching reports six Sounders are back this year, including Patch, Little Patch and Dubknuck, as well as two new whales that showed up in Puget Sound waters for the first time last year. Researchers and whale watchers first spotted the new whales labeled #185 and #2246 in March of 2018. Unlike the group of veteran whales, these new whales stuck well past spring. The Orca Network believes #2246 left after the spring migration but returned in the fall, when it was spotted again in November 2018. The other newbie, #185, never left, choosing to stay in Puget Sound waters year-round. Calambokidis isn't certain what these changes mean for the whales, only time and continued study will help to determine why the Sounders are adjusting their patterns. "While the reason for these out of season sightings of the “Sounders” gray whales is not known for certain, it may be a result of some apparent food stress in the overall gray whale population observed in 2018 that may be resulting in their seeking areas new areas and timing for feeding," Calambokidis said. The rest of the veteran group are still expected to make their return in the coming weeks. Their return to the area year after year indicates to researchers a need for food, but as Calambokidis points out, their resilience is promising. As more whales enter the region, Calambokidis said he continues to worry about their safety. He warns people not to increase vessel traffic trying to find whales. Instead, look out for the 40-feet visitors from nearby land or from organized whale watching trips. In 2017, a boat struck a gray whale near Whidbey Island. The Cascadia Research Collective said the whale had been “likely confirmed” as Earhart (#22), an older female gray whale.